The dual media systems on the island of Cyprus, situated south of Turkey, reflect the contentious ethnic divisions between its Greek and Turk constituencies. The press situation is active and politically driven, in a nation with a high rate of literacy. Political divisiveness fosters an immediate, practical interest in competing ideologies and in organs reflecting those views. Much press activity is colored by the political agendas of the sponsors. By mid-2002, no political settlement to effect national unity had been reached. The independent Republic of Cyprus ( Dimokratia Kyprou —Greek; Kibris Cumhuriyeti —Turkish) was established in 1960 and joined the Commonwealth in 1961. Effective partition came in 1974, when a Greek-led initiative triggered intervention by Turkey. By 1983, the independent Turkish Republic of Northern Cyprus (Kuzey Kibris Tÿrk Cumhuriyeti, TRNC) was established. Though formal recognition has come only from Turkey, the United Nations and the United States have acknowledged official spokesmen of the Turkish Cypriots. Since 1974, the Greek majority has controlled the southern sector, with more than half the land mass, and over three-quarters of the population, and a preponderance of the wealth. Some 200,000 Greek Cypriots found refuge in the south after 1974, evacuating their former homes in the north. The Turkish minority commands the rest of the island. The centrally located capital, Nicosia (renamed Lefkosia by Greeks in 1995), sits astride the east-west dividing line, and in 1996 had a population of some 211,000 Greeks and 40,000 Turks in its two respective sectors. Greek-dominated cities in southern Cyprus include Limassol (population in 2000: 162,000), Larnaca (73,000), and Paphos (39,000). The major urban center in the northern sector, aside from the Turkish part of Nicosia, is Gazi Magusa (Famagusta), population 27,742. For the year 2000, UN population estimates were 793,000 for the Republic of Cyprus and 177,120 for the TRNC. In the late 1990s, nearly seventy percent of Cypriots were urban. Greek and Turkish are official languages in the south, while Turkish predominates in the north. English is widely spoken everywhere. Compulsory education and suffrage are the pattern in Cyprus. The proliferation of politically focused print media in both sectors reflects this, as does an adult literacy rate of about ninety-five percent (in 2000). Figures for 1994 show eight daily newspapers published in Nicosia in Greek (English translations of titles and circulation figures listed as daily averages are to be found in parentheses): Phileleftheros (Liberal; 21,886), an independent paper; Apogevmatini (Afternoon; 7,291), independent; Simerini (Today; 7,290), right-wing; Haravghi (Dawn; 6,927), the organ of the (Communist) Progressive Party of the Working People (AKEL); Alitha (Truth; 4897), right-wing; Agon (Struggle; 4,069), right-wing; Elef therotypia (Free Press), moderate; and Machi (Battle), right-wing. In 1996, nine daily newspapers had a total circulation of 84,000, and 31 other papers had a combined circulation of 185,000, indicating a very high readership rate per capita. News agencies with offices in Nicosia include numerous foreign bureaus and the Greek-sector Cyprus News Agency (Kypriakon Praktoreion Eidiseon—KPE). (Morning), Milliyet (Nationality); Hÿrriyet (Liberty) and Yeni Yÿzyil (New Century). The news agencies in the Turkish sector are Turkish News Cyprus (Tÿrk Ajansi Kibris—TAK) and the Northern Cyprus News Agency (Kuzey Kibris Haber Ajansi). Before the 1974 division, the quasi-governmental Cyprus Broadcasting Corporation (Radiofonikon Idryma Kyprou—RIK) and the state-owned Radyo Bayrak and Radyo Bayrak Televizyon controlled national broadcasting. A law of June 1990 allowed commercial radio and TV to operate. In 1995, there were four TV stations (with 225 low-power repeaters). Into the late 1990s and the new millennium, RIK provided radio service in the Greek sector, with three additional island-wide stations and twenty-four other local stations. Broadcasts are mainly in Greek but also in Turkish, English, and Armenian. RIK has also provided television service from a transmitting station at Mount Olympus. In the late 1990s, the Greek channel ET-1 was being rebroadcast on Cyprus, with the BBC East Mediterranean Relay and the British Forces Broadcasting Service, Cyprus, also providing radio service. 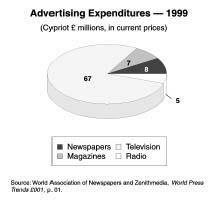 In 1998, Greek Cypriots had one short-wave, seven AM, and 60 FM radio stations. In 1997, they owned about 310,000 radios and 248,000 television sets. Broadcasts in one sector are usually accessible in the other. 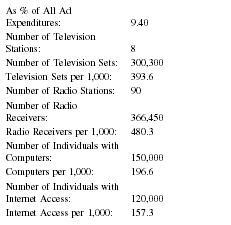 about 268,000 radios and 82,000 TV sets in 1994. Two independent radio stations, First FM and Kibris FM, were broadcasting, as were two private television channels, one private pay-per-view TV channel, two foreign broadcasting stations, and numerous local radio stations. In 1995, four TV stations (with five repeaters) operated. In 1998, one short-wave, three AM, and eleven FM radio stations were on the air in the Turkish sector. Figures for the year 2000 showed six Internet providers and about 80,000 Internet users on the island. In August 2002, the Cyprus News Agency maintained a web page that was available in Greek at www.cna.org.cy , and program summaries in English of some broadcasts of the Cyprus Broadcasting Corporation were available on the Internet at www.countrywatch.com/cw_wire.asp . 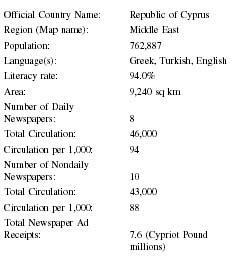 Additionally, The Cyprus Weekly, The Cyprus Mail, and The Cyprus Communications Centre (a daily Internet newspaper in Turkish) all had web sites. Live radio broadcasts from Cyprus were available (for a fee) at www.vtuner.com , and a complete listing of Greek radio stations was available at www.media.net.gr . 1985: Constitutional freedom of the press (with specified restrictions) is guaranteed in the Turkish sector. 1990: A law allows commericial radio and TV in the Greek sector. Banks, Arthur S. and Thomas C. Mueller, eds. Political Handbook of the World. Birminghamton, NY: CSA Publications, 1999. The Central Intelligence Agency (CIA). CIA World Fact-book 2000 . Directorate of Intelligence, 9 May 2002. Available from http://www.cia.gov/ . Turner, Barry, ed. The Statesman's Yearbook: The Politics, Cultures, and Economies of the World . 136th edition. New York: St. Martin's Press, 1999. World Almanac and Book of Facts . New York: World Almanac Books, 2002.
l would like to be informed on the % distribution of recreational magazines that are nationaly published,in Cyprus.That is reg,sports,fishing and hunting.